Published: April 3, 2013 at 01:45 p.m. Updated: April 12, 2013 at 01:36 p.m.
With the 2013 NFL Draft set for April 25-27 at Radio City Music Hall in New York, NFL.com draft analyst Josh Norris is identifying the top prospects available at every position. » Star Lotulelei, Utah: Played in 91.2 percent of defensive snaps. 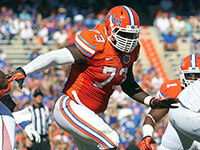 » Sharrif Floyd, Florida: Possesses ideal frame for interior DL. » Sheldon Richardson, Missouri: Fletcher Cox-esque skill set. » Jesse Williams, Alabama: Blessed with great strength, athleticism. » Ezekiel Ansah, BYU: Has the best closing speed of any end. 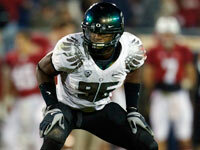 » Dion Jordan, Oregon: Already very comfortable in coverage. » Barkevious Mingo, LSU: In terms of raw tools, few surpass him. » Damontre Moore, Texas A&M: Biggest conundrum of 2013 class. » Alec Ogletree, Georgia: Great closer with coverage ability. 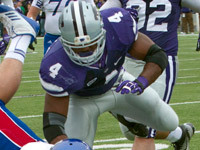 » Arthur Brown, Kansas State: Range to sideline is exceptional. » Kevin Minter, LSU: An absolute missile between the tackles. » Manti Te'o, Notre Dame: Good -- but not great -- starter in NFL. » Dee Milliner, Alabama: Top CB is smart, disciplined and physical. » Xavier Rhodes, Florida State: Great length, aggressive mindset. » Jamar Taylor, Boise State: Provides outstanding versatility. » Johnthan Banks, Mississippi State: Big body entices NFL scouts. » Kenny Vaccaro, Texas: The type of player defenses covet. » John Cyprien, FIU: Has range to be interchangeable safety. » Shamarko Thomas, Syracuse: Missile closing on ball carriers. 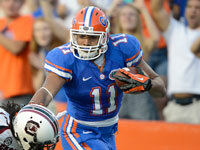 » Josh Evans, Florida: He works through trash quite well. 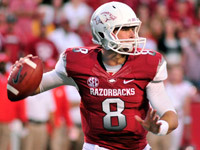 » Tyler Wilson, Arkansas: Potential far outweighs lack of buzz. » Geno Smith, West Virginia: Focus on his skills and poise. » Zac Dysert, Miami (Ohio): Plenty of great qualities as a passer. » Mike Glennon, N.C. State: His landing spot will be crucial. » Eddie Lacy, Alabama: Great blend of size, power and speed. » Giovani Bernard, North Carolina: Instant threat in passing game. » Andre Ellington, Clemson: One-cut back reads lanes very well. » Johnathan Franklin, UCLA: Stellar vision and straight-line speed. » Tavon Austin, West Virginia: The premier playmaker in this class. » Cordarrelle Patterson, Tennessee: Smooth runner with balance. » DeAndre Hopkins, Clemson: Most consistent receiver in this draft. » Keenan Allen, Cal: Slow 40 time could drop him into Round 2. » Tyler Eifert, Notre Dame: Probably the only first-round tight end. » Travis Kelce, Cincinnati: Has everything you want on the field. » Vance McDonald, Rice: Can he transition from slot to inline spot? » Jordan Reed, Florida: Reminiscent of ex-Gator Aaron Hernandez. » Chance Warmack, Alabama: A truly dominant player. » Eric Fisher, Central Michigan: Athletic and aggressive. » Luke Joeckel, Texas A&M: Has well-rounded experience. » Terron Armstead, Arkansas-Pine Bluff: No mere workout wonder. Follow Josh Norris on Twitter @JoshNorris.